— So, I'm a woman pretending to be a man pretending to be a woman. — You know, pretending to be a man does have its disadvantages. Hi, maybe you have already noticed this poster. 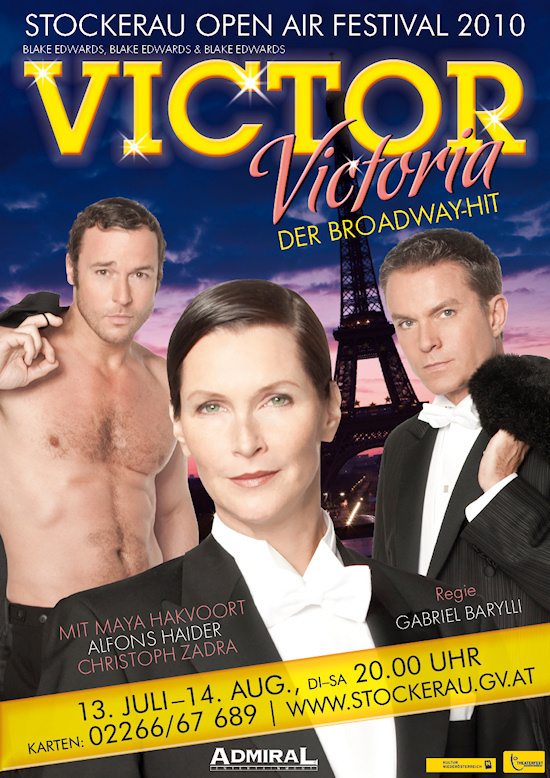 The Broadway musical adaption of the 1982's comedy Victor Victoria is coming to Austria. I still remember the funny restaurant scene for instance, where Victoria, brilliantly played by Julie Andrews, is starving to death and finally goes to a restaurant without having enough money to pay for the meal. There she meets Toddy (Robert Preston), who is in a similar situation, broken and unsuccessful as a singer. But toghether they have a plan and the rest of the plot is best described by the dialog above ;-) It is a nice comedy of mistaken identity. It is also interesting to note that the movie is actually a remake of the much older German movie Viktor Viktoria from 1933 with Reante Müller and Hermann Thimig in the main roles. The Austrian version of the musical is now performed by Maya Hakvoort and Alfons Haider as part of the Stockerau Open Air Festival. The premiere is on July 6th. Regular performances are from 13th July till 14th August 2010 in Stockerau, Lower Austria.